my weekly vampire dose :) | escaped. Elena: Am I going to be safe with you? 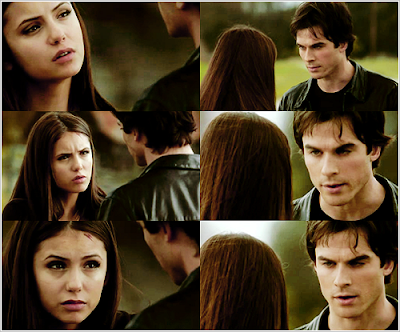 Elena: Do you promise not to do that mind control thing with me? Elena: Can I trust you? Damon: Get in the car, come on. I've been watching this series since my friend recommended the show to me a few weeks ago. At first I was all like "WTF another vampire show??" but later after finally watched the first episode, I fell in love with everyone in the series..seriously. So I know, if you haven't watched this series in your head you'd be thinking this is just another lame vampire story. This show puts Twilight to shame. The story is basically about a high school girl (Elena Gilbert) torn between two vampire brothers (Stefan Salvatore and Damon Salvatore). Click here for the plot summary. So basically nowadays my weeks are spent obsessing over Damon The Vampire Diaries, so if you see me being busy a lot lately, it's 50-50 chance between studying (because finals are starting, like, next week) and Damon..hehe.